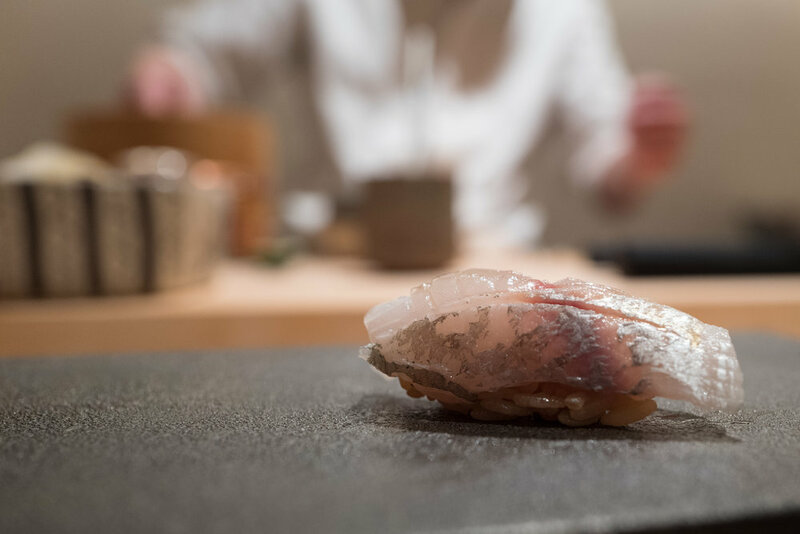 I recently had the good fortune of scoring a much-coveted seat at the main counter of one of 2018's hottest new Tokyo restaurants - "Hakkoku", the new sushiya from rising culinary star Hiroyuki Sato. 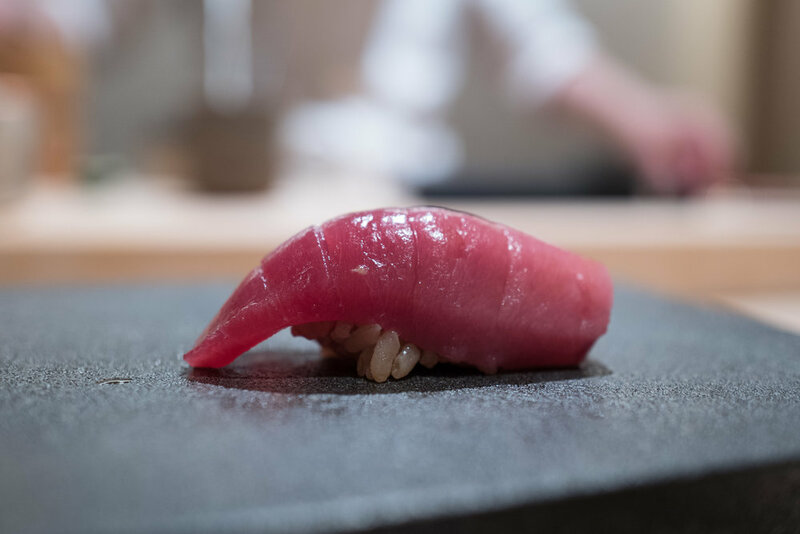 Chef Sato rose to prominence at Sushi Tokami, where, as the head chef, he quickly gained world-wide accolades and a Michelin star. Sato-san left Tokami about a year ago and opened his new shop Hakkoku in February of this year. The restaurant is located in the middle of Ginza (6 Chome) and occupies the entire third floor of a building. There are three counters, each sitting six patrons, although at the moment only two counters are open (I have heard the third counter will begin operations in a few months). The interior design of the restaurant is strikingly beautiful - a modern, ultra-minimalist Japanese aesthetic that works so well for high-end sushi shops. 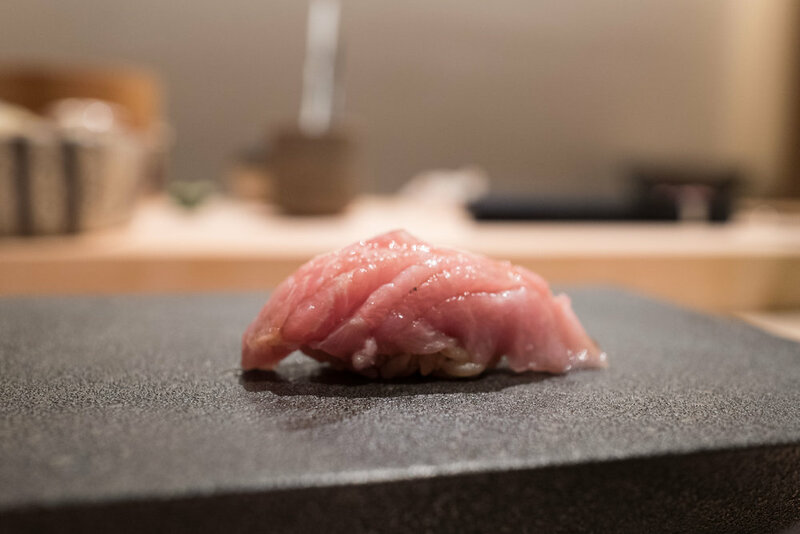 Chef Sato is as funny and charismatic as ever; he is not only an excellent sushi chef but also a fantastic host who has a natural ability to interact with customers and create a relaxed, enjoyable atmosphere at the counter. 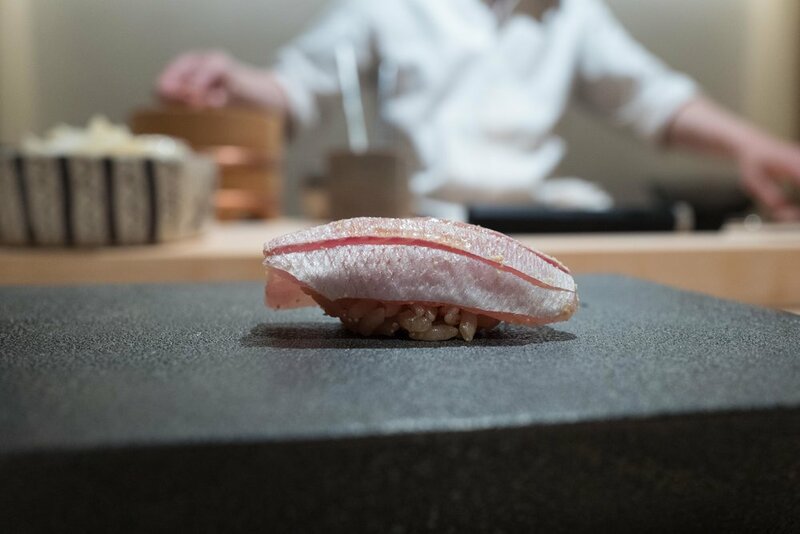 The meal opens with one of Sato-san's signature offerings: a wonderful tossaki temaki (a cut of maguro from the base of the tuna's head that is very high in flavor). No otsumami are offered, instead the focus is strictly on nigiri - with a rather astounding 32 pieces being served on the night I was there. Chef Sato's shari preparation, which became quite famous at Tokami, remains: al-dente shari strongly seasoned with two types of akasu, rendering the shari a dark brownish color. The rice is on the saltier side, and appears to be calibrated to work well with nihonshu and fatty, full-flavored neta. Although it is not my absolute favorite, I did enjoy the flavor of the rice and found it to work very well with most sushi-dane. 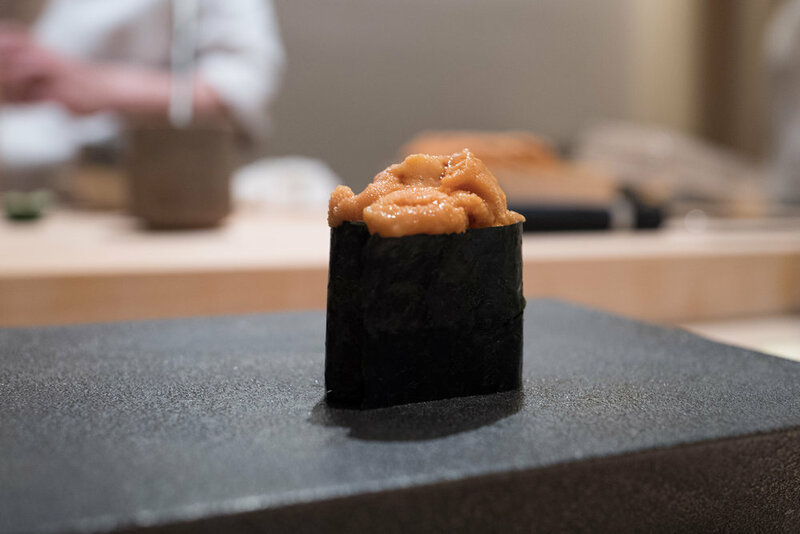 The quality of the neta is remarkably high throughout, with a few rare bites being offered: raw anago and budou ebi being two examples. 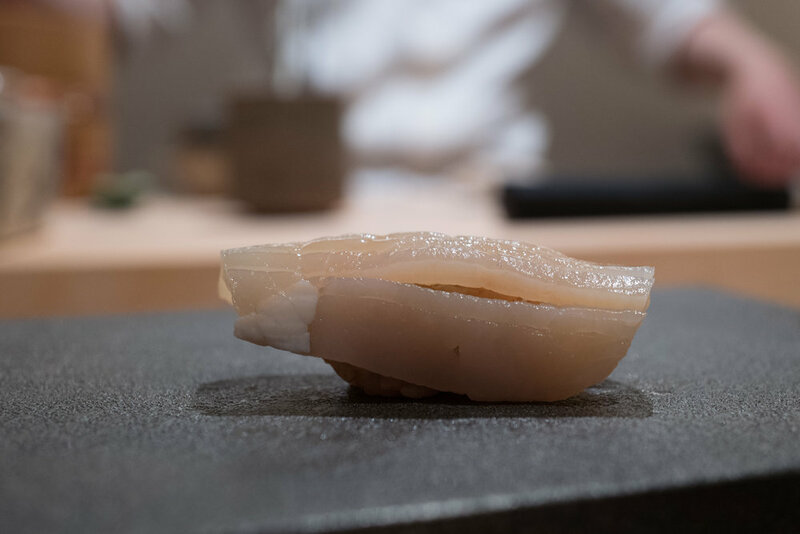 Other standouts: the in-season iwashi, the out-of-season yet delectable hon-maguro (all pieces of maguro were great and worked so well with the shari), the ankimo, the subtle, sweet makogarei, the toothy torigai,... I could go on. Again, I found the neta to be of uniformly high quality and wonderfully tasty - there was not a single "weak" piece - a tribute to both the quality of ingredients and chef Sato's preparation skills. The only downside? Hakkoku's pricing reflects the very high quality product on offer. I paid roughly ¥41,000 all inclusive, with a draft beer and 2 or 3 glasses of nihonshu. Definitely not cheap (actually, the priciest meal on this trip) - but in my opinion well worth it. It should be noted that Sato's counter is booked out quite a few months in advance, so if you would like to sit with him instead of the second chef, you'll want to reserve as early as possible. Seats can be secured via good hotel concierge services (such as this one) and via Tableall. Below you will find photos of all items (minus the aforementioned tossaki maki, the vegetable palate cleansers, and the soup) in the order they were served. Clockwise from top left: kasugodai, isaki, budou ebi, and satsukimasu. Left: kisu kobujime. Right: tako. Left: nama anago. Right: sumi ika. Maguro quartet, from leanest (upper left) clockwise to fattiest (bottom left). Left: ebodai kobujime. Right: tairagai. Chef Sato preparing bafun uni gunkanmaki. Clockwise from top left: kinmedai, tachiyo, nodoguro, and bafun uni.